Taking up new activities such as painting or learning to play a musical instrument can boost your brain health. When it comes to what happens to the brain as it ages, don’t believe everything you hear. There are many myths about the ability of older people to keep their memory and concentration in tip-top shape. There is no evidence that brain games, for example, live up to their promise of better mental acuity. That’s one finding in a new report by the Global Council on Brain Health (GCBH), an independent collaborative of scientists, health professionals, scholars and policy experts that was convened by AARP. 1. Older people can’t learn new things. Not so. Trying new activities can actually stimulate cognitive skills. 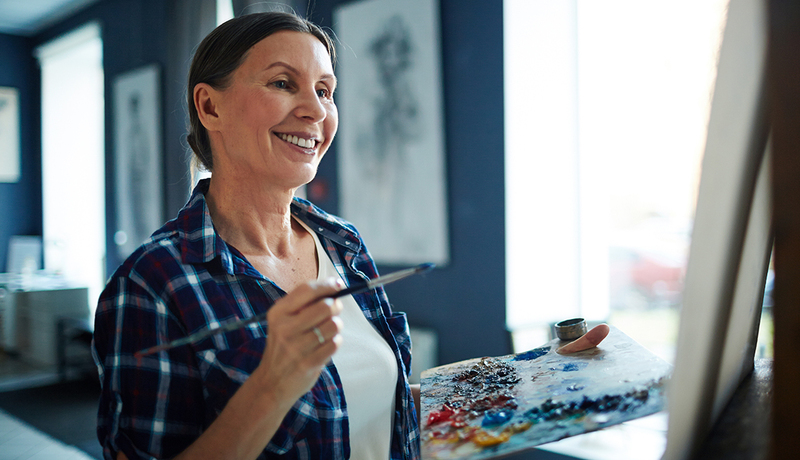 Seeking out new social connections that involve learning names and information about the people you meet, going back to school and taking up a new musical instrument are just a few examples of activities that can boost your brain health. 2. You’re stuck with the brain you were born with. Also not true. Brains are made up of cells called neurons. While it’s true that most of the neurons are created before birth, studies have shown that new neurons can be created in the area of the brain that deals with learning and memory. Researchers hope that by better understanding how new neurons are created, they can help individuals with brain injuries and neurodegenerative diseases. 3. Experts don’t have a clue about how the brain works. Actually, scientists are learning more about the brain every day. Granted, it is a complicated organ. But new treatments for neurological conditions are coming to light, and researchers expect exciting breakthroughs down the road. 4. It’s inevitable that older people will get dementia as they age. Not true. Dementia can be caused by Alzheimer’s disease or age-related events, such as a stroke. But getting older doesn’t automatically mean you will get dementia. And it doesn’t mean you are developing dementia if you can’t remember the name of an old acquaintance you run into at the grocery store. 5. Learning a new language is for the young. It is usually easier for children to pick up a new language, as sentence structure tends to be less complex for them — and they tend to be less self-conscious when trying something new. But adults also can learn a new language. In some countries, such as Sweden, it’s common for retired people to take classes for a third language. 6. Older people are doomed to forget things. Being forgetful about details such as names and facts happens to everyone, no matter his or her age. Poor memory can often be attributed to lack of attention. Some helpful tips on remembering include writing things down (such as shopping lists) and taking note of visual details associated with your surroundings. 7. Just take memory training, and you’ll be fine. Not exactly. While it’s a good idea to look for ways to fine-tune your memory, if you don’t practice those skills and keep challenging your brain, all that hard work will be wasted. It’s the ultimate “use it or lose it” advice.